That’s also why I sign up for Book Riot’s quarterly subscription box. Four times a year, the book-loving website BookRiot.com chooses a theme centered around the reading life and curates products to ship out to subscribers. At first glance, I dismissed “The Word Exchange” as a bandwagon book — just another tale of dystopian future society. But when I read the back cover synopsis, I couldn’t deny being intrigued. Books, libraries and newspapers are extinct, wordsmiths still cling to crafting dictionaries and a “word flu” is spreading. Well-played, Book Riot. Way to tap into a word lover’s interests. “Smarter Than You Think” is the real prize, though. The book addresses how every technological innovation, from the written word to the printing press to the Internet, has created worry that society will never be the same and that culture is eroding. However, Thompson argues each innovation has improved society and we continue to retain what is good of the old while moving forward with the new. As a reluctant converter to e-books and hoarder of print books, I’m eager to dive into Thompson’s analysis. The Grid-It organizer was the weakest link for the theme (and a bit too non-bookish to appreciate). The Grid-It isn’t useless — it can snugly carry cellphones, charger cables, earphones, a wireless computer mouse and other tech accessories, or it can be repurposed to hold makeup, notebooks or any other travel items you don’t want floating loose in your luggage. Larger models listed on Cocoon’s website include cases to carry tablets and e-readers, which would have made more sense with the subscription box, but their price is twice the cost of the small version issued by Book Riot. 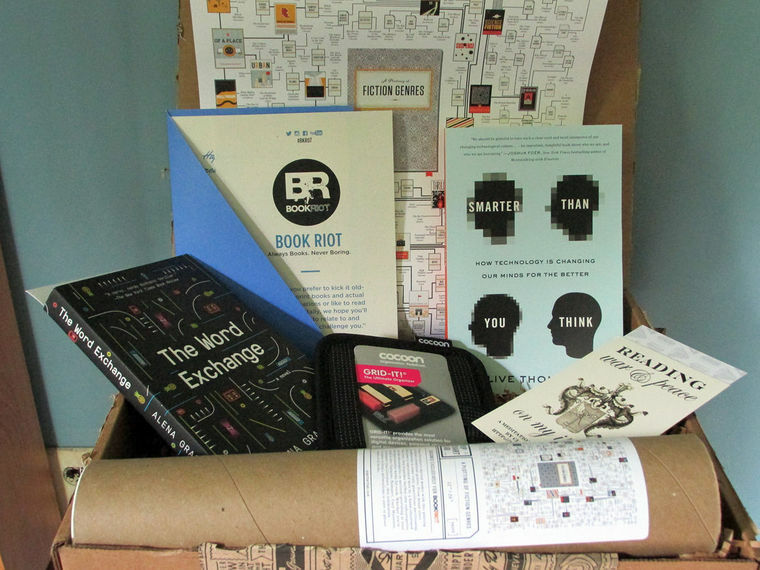 A strength of Book Riot’s subscription boxes is the inclusion of exclusive items, such as this quarter’s “A Plotting of Fiction Genres” poster, created by Pop Chart Lab. Items like this are why book nerds subscribe to the box: for fun reading-related products. The $50 spent on the box is a bargain. One book’s list price is $17, and the other book is $15.95, while the organizer is priced at $11.99. The poster is tougher to price since it was made specifically for Book Riot boxes, but similar 12-by-16-inch posters at popchartlab.com go for $20. That would put the retail value of this box at $64.94 — a $10 savings, after you account for the $4.99 paid for shipping. WHAT’S IN THE BOX is a monthly feature in Better Times reviewing subscription boxes available online. This entry was posted in Reading and tagged Book Riot, books, reading, subscription box. Bookmark the permalink.